I’m Kevin Gillis and I’ve had the honour of knowing Len Carlson for over 26 years, and as I look about this room, I see a wide cross-section of the many people that Len touched in his life – Actors, Producers, Studio Owners, Engineers, Musicians, Writers, Directors, Friends and, most of all, his Family. My wife reminded me over the weekend that in a business that has its fair share of conflicts, I can’t recall anyone ever saying a bad word about Len. In fact, the corollary is the more poignant truth. Not once, in the 26 years I knew Len, did he have a bad word to say about anyone. He was honest and he was happy. He was the consummate professional. He came to work always on time and well prepared. Voice Directors like Merle Ann Ridley would joke that if he was late, you’d know that his agent must’ve screwed up the recording call. (Apologies to all agents here!). Contrary to the widely held popular belief (perpetuated by Len Carlson) Len was not an American. He was born in Edmonton, but of U.S. parents. Len’s parents wanted a girl and dressed Len accordingly (this might explain the shirts). Finally, when they did have a girl, Len was sent to be raised by his grandparents on Vancouver Island. It was here that Len started off on his life long love for dogs. Len was a proficient athlete growing up. In the 50s, Len pitched for the San Francisco Giants farm team in Savanagh until an injury foreshortened his promising baseball career. He was always interested in acting and entertaining others with his voices and went to work in radio and television. And it was there, in Calgary in 1964, that he met Judy – his “HUNAH”. As fate would have it, Judy and Len shared an office where Judy was receptionist and librarian for CFCN. Len, knowing a good thing when he saw one, put on, as Judy recalls, his “Mr. Romance moves”. Len was a household name in Calgary for his “Colonel Loonar” characters on CFCN TV (he did all 10 different voices and puppeteering for the characters -- a sure sign of things to come). As a TV star for kids’ shows in those days, Len would receive merchandise from the various companies wanting their products promoted. Mattel gave Len a new Barbie which he quickly incorporated into the show and renamed Little Miss Judy. That sealed it. From Calgary, Len went onto do TV stints in Vancouver, Seattle and finally, in 1965, he and Judy came to Toronto where he landed a job at CKFM under the wing of Herb May. Len and Judy had many interests together; boating, stock car racing, dogs and restaurants. Len was known by the lockmasters throughout the Trent Severn system as the guy in the Chris Craft with the blonde lady’s wig (another leftover from his childhood no doubt!). Len loved to cook, so much so that he decided they had to open a restaurant, Café Au Passant was Len’s passion – for 6 months. Then it was Lenny’s on the marina and finally Judy C’s. Len worked hard at his craft. He had an intense interest in characters and comedy. He came to the sessions well prepared, with suggestions on how to improve upon the lines and the character. Normally, producers and directors would cringe at this (Believe me). But not with Len. Many a time, he would start with a one shot character voice, which he would develop so strongly that the producers and writers had no choice but to expand. Then one day, we’d turn around and that character would be one of the stars of the show. Oh, and did I tell you that he could also be conniving? 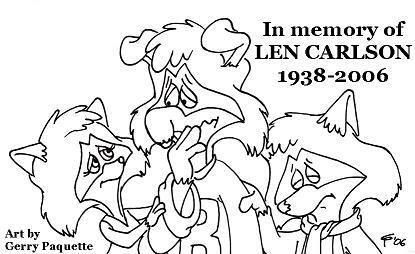 I remember in the early 80s, after we had done Christmas Raccoons and Raccoons on Ice together (Len was Bert Raccoon), I told Len we were planning a series for the Raccoons and wrote up a small part for 3 pigs. We auditioned many people for the 3 roles and we filled the role of Pig #1 and Len as Pig #2. During a read-through, Len filled in for Pig #3 as the part was yet to be filled (Not for long – Len got it!). This is how he worked; he would help you out with suggestions. If he didn’t get the part, that was OK with him, he was always happy to help. Len always wanted what was best for the show. Most of the time though, he nailed it. It didn’t matter if the part was male or female, or whether he had to play against another part he had. Len had the gift to know what you wanted. Len didn’t just do voices; he played many principal roles for film and television dramas including Call of the Wild, The Judge, Race For the Bomb, The Henry Ford Story and The Dejay, a Hallmark Showcase production for which he received an Emmy nomination. 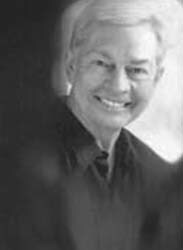 As a voice actor, Len appeared in thousands of animated cartoon episodes, juggling as may as 8 to 10 voices per show. The Tooth Brush Family on Captain Kangaroo – where he played all the parts and did the puppets too! Under hush-hush conditions, I understand he even stood in for Mel Blanc as Porky Pig. He was the original Rocket Robin Hood and Spiderman! 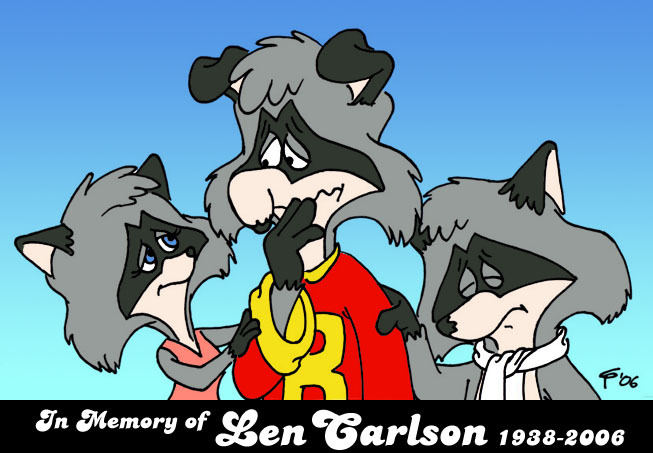 On the Raccoons, he was Bert Raccoon, the star, as well as 2 of the little pigs, Lloyd and Floyd, Mr. Knox and countless others. He was Pappy in Rolie Polie Olie. A part Jesse Thomson, his director, says he did as if his teeth kept falling out. On purpose – rest assured. He played numerous characters in Mr. Men’s Fun House, Donky Kong, Carebears. He starred in both Roboroach and Berenstein Bears. His shows have been seen in over 180 countries on all of the top networks (Disney, BBC, CBC, Teletoon, YTV, ABC, CBS, and on and on). And because of the timelessness of both his craft and animation, I have no doubt they will be enjoyed for years and years to come. By future generations of young children the world over. Len was a joy to his peers. He was always happy. He never let anything interfere with his work. Colin Fox, his co-star on Atomic Betty, was recalling to me how on the 1st recording session, he wondered who this guy was opposite him. You have to appreciate that Colin is a classical actor and here he is facing a well-tanned man in sunglasses, a Robin Hood shirt and cowboy boots – playing multiple personalities. Well, the 2 of them hit if off like no tomorrow! From the control room – it was like the Odd Couple Incarnate. And that’s part of what made Len so special –he made you feel like an old friend from the moment you met. With the younger actors, Len was always generous. He had patience and experience which he would share with the young talent starting out in their careers. I remember one time, years ago, Len was working with a young actor who was having problems with his lines. Len asked that we turn the studio microphone off and we could see him gently speaking to the young man in private. After a few minutes, Len signaled us and we resumed the session without a hitch. I never knew what Len said, but it worked. In his own work, Len had the amazing ability to recall voices that he had done sometimes 1 or 2 seasons prior, always in character, as it if was just 5 minutes earlier. If you had a character and you wanted to age it up or down, Len would ask, “How much? 1, 2 or 5 years” – and deliver right on the mark. When I met with Judy and Corina to discuss the arrangements, I was taken aback but not totally surprised to hear that Len had very little of the work he had contributed to over the years. No tapes and no up to date photos. In some ways, that was the kind of guy he was. He didn’t make a fuss. He came to work to have fun and see you next time. Len was a husband of 40 years, a father, a brother, a grandfather, a teacher, a dreamer, a prankster, a friend, an actor, a character. He made his mark on our lives and our work like no one else could. We will miss him dearly, but he will always be there entertaining us. I am sure he’s looking down on us now asking – So, was it a good take?, or Let me try another. Thank You, Len – The writers wrote the lines, but you created the characters.